Too Clingy/Not Enough Time for Him-if you do not enjoy a dog that is velcroed to you at all times, this is not the breed for you. They sit on your newspaper or laptop while you drink your Sunday morning coffee, lay on your hair and stick their nose in your ear while you try to nap on the sofa, and attempt to join you in the potty because you are sitting and that means an open lap invitation in their eyes! When not invited into a room with you, you will likely trip over them when you open the door. They live to be with their human and are either at your feet, in your lap, or trying to get under the blankets with you all the time. At minimum, they expect to be within sight of you pretty much all the time. For many IG fanciers this is a particularly cherished trait of the breed, but not every personality can tolerate it. Due to this close human bond, some IGs (younger ones in particular), do not tolerate long hours alone every day. For this reason we typically recommend a more mature IG to families that have busy work schedules. They are much more in tune with lounging around and entertaining themselves during the day while waiting for their peeps to come home. This makes for a happier IG AND a much happier owner. 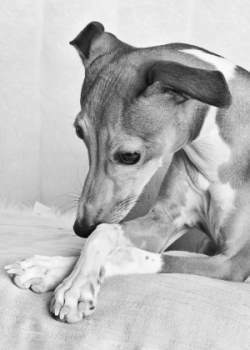 Older owner that can no longer handle the IG or keep him due to personal health issues-Italian Greyhounds live a LONG TIME. Most live well into their teens and there are not always family members available to take on an additional pet when their owner can no longer care for them. They also mature much later than other breeds. Many IGs do not ‘mellow out’ until they are around 3 or 4 years old. Mature owners are typically much happier with an older low-key IG that prefers perching in a lap or lounging in a sunbeam for the greater part of the day as opposed to one that is bouncing off of furniture, jumping up and injuring fragile skin with their nails, squeaking toys non-stop, and needing ANOTHER walk to get rid of excess energy. Posted in Featured Dogs on April 1, 2019 by dennis.